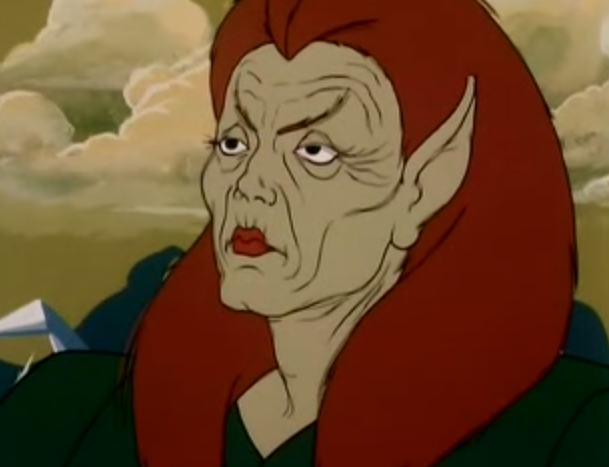 This episode of Blackstar (1981), "The Quest" sees a trobbit, Poulo, in danger. While fishing, he falls into the water and is infected by by the "poison of the pond." An effort is made to cure him using an ice potion, but it fails to bring down Poulo's terrible fever. The Trobbits and Blackstar realize that only a legendary healing stone -- in the possession of the "Desert Dwellers" -- can save him. Blackstar and Klone travel to the desert and help the dwellers stave off an attack by deadly gargoyles. 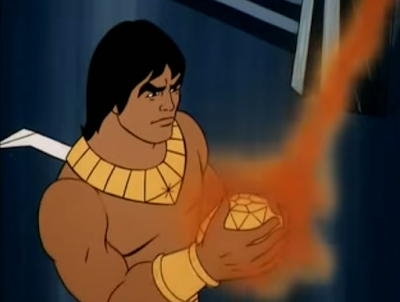 In return for their courage in battle, the dwellers loan Blackstar the healing stone for "six moons." 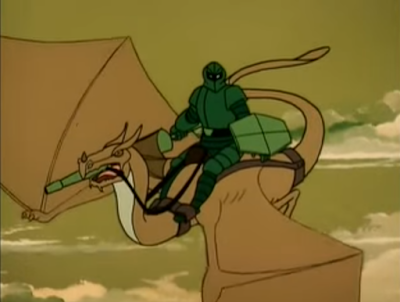 But a minion of the Overlord, the Emerald Knight, steals the stone, and takes it to Overlord, in his heavily-guarded ice palace. Blackstar, Klone, and Mara travel to the ice palace, confront the Emerald Knight, and launch a battle to re-acquire the healing stone for their trobbit friend. "The Quest" is an exciting episode of Blackstar, with a nice, didactic counter-point between heroic and villainous characters. The Emerald Knight, we learn, is a woman who has been given the gift of eternal youth by Overlord, so long as she wears her helmet and serves him. So she has sacrificed her soul, basically, for herself; for her own vanity. She remains young, but serves evil. 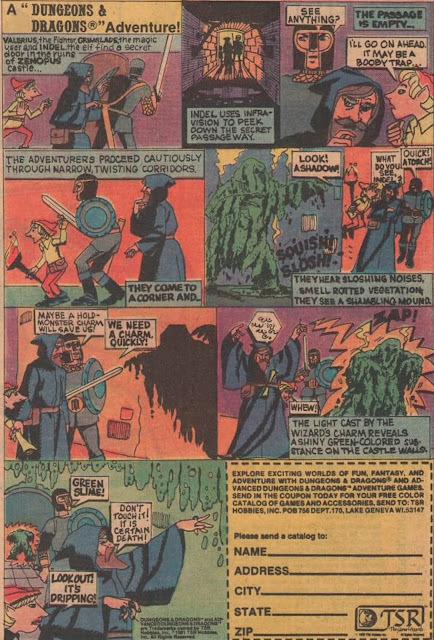 And then we have John Blackstar, a hero who fights gargoyles, travels a great distance, and risks life and limb to save a friend, Poulo, who suffers from "the poison of the pond." He is a man of his word, both curing Poulo and returning the healing stone to those whom he borrowed it from. There's still plenty here to second-guess. Klone still shows no personality. He's just a walking story-device: shape-shifting. 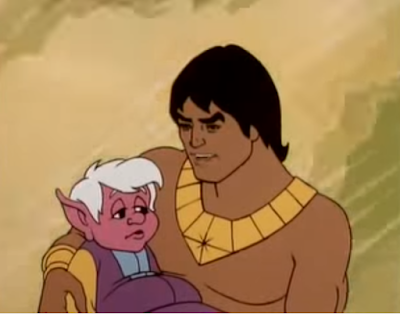 Overall, however, "The Quest," is a strong episode of this Filmation series, especially because it contrasts the selflessness of Blackstar with the selfishness of the Emerald Knight. It's nice too that she sees the error of her ways, and becomes a friend, proving she isn't evil...merely misguided. We all make mistakes, and we can all be forgiven.